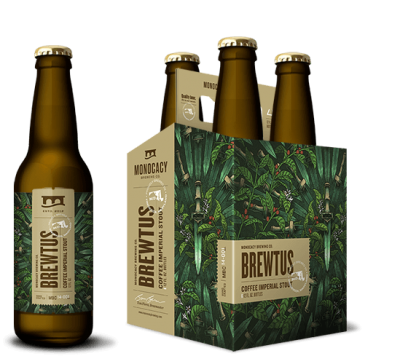 Monocacy Brewing Company is releasing a Coffee Imperial Stout, called Brewtus, in Maryland, Pennsylvania, and Washington, DC markets on the Ides of March, Saturday, March 15. This robust interpretation of English brewing tradition is the second variety released by Monocacy Brewing Company offered year-round in both bottle and keg formats. Like its predecessor, Riot Rye Pale Ale, Brewtus is brewed using quality local ingredients. The coffee aroma and taste of this 8.6% abv Coffee Imperial Stout is conjured from select, dark-roasted malts and freshly roasted, whole “Red Bourbon Rwanda” estate coffee beans from Dublin Roasters of Frederick. The tasting room at Monocacy Brewing Company is open to the public for beer sampling and growler filling on Friday evenings from 4:00 pm to 8:00 pm. Tours, tastings, and growler fills are offered each Saturday from 12:00 pm to 4:00 pm. Visitors to the tasting room are encouraged to visit Dublin Roasters, located across the street from the brewery, to take home the Red Bourbon Rwanda coffee in 0.25 lbs., 0.5 lbs., 1 lbs., and 5 lbs. quantities. For more information about the Monocacy Brewing Company visit www.monocacybrewing.com or reach out to Jim Bauckman at (240) 457-4232 or via email at jimb@brewers-alley.com.